Highborn pups are available on a first come first serve basis. Our puppy prices start at $1,800.00 for a pet (limited registration). Rare Reds or nicely marked Chocolates will be $2,000 but can be as high as $2,500. Limited Registration simply means you are not interested in breeding or showing and you agree to spay/neuter your puppy by 6 months of age. We do occasionally give out breeding rights. Full registration is an additional $1,000-$2,000 fee and will be considered on an individual basis. If you wish to bring home one of our puppies & wish to be placed on our wait list, we require a $500 non~refundable deposit. Pick of puppies will be in the order of deposits received. However once the pups are born, if we do not hear from our perspective buyers within a few days (3 days) of birth that person will lose their pick place in line. Personal checks are acceptable for the initial deposit only with the balance being due in cash when the puppy goes home. You may also make payment a week in advance through pay~pal (an additional 3.5% will be added). There is a $30.00 fee for any returned checks. If for any reason I am uncomfortable with the choice of placement for my puppy, I hold the right to refuse or quit the adoption procedure at any time in which case, the 'non~refundable' deposit will be returned. 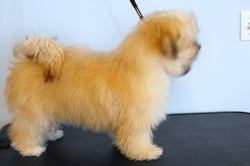 Highborn pups are high quality puppies with a long lineage of champions that may be viewed here on our 'sire' or 'dam' page. Both of our stud dogs (Kash & Andy) are champion sired & both are imported from Hungary. Our females have wonderful lineages with many champions as well. Sadie and Ange are our new Chocolate females. We retired Grace last fall and we were very selective in our new choices for females. Our dogs have been specially selected from amazing AKC champion lines which include Carrycot, A Maiden Effort, Salemi, Black-Puppies and Oye Chico Papa Montero. While we breed for temperament, health and personality, our dogs will not only make great family pets many will make wonderful show prospects as well. We can't guarantee they will win in the showring, however they will be a wonderful example to the standard of the breed! 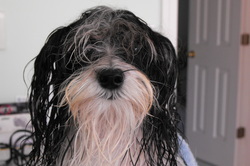 Havanese do require frequent grooming throughout their entire life. Unless you keep them in a puppy cut, Havanese hair may grow 1" (inch) in length a month. Hav's lose their hair similar to the way human hair is lost. Therefore they are considered non shedding. They are odorless and hypo allergenic. Possibly a great choice for those with dog allergies. Their coat needs to be brushed at least every other day. If they are in a puppy cut it's good to brush them once a week and bathed every 3-6 weeks unless otherwise needed. Teach your puppy early in life to stand and to lie quietly while grooming. He will soon stand quietly and willingly throughout his/her entire grooming session. I taught myself to groom both of my Hav's. It isn't as difficult as I thought it would be and well worth the savings to learn to do it yourself. If you wish to save money on grooming & are interested in learning to do it yourself, there are many helpful grooming videos on Youtube that are worth a look. When Grace was in a long coat, daily brushing was required to keep her coat free of mats and tangles! 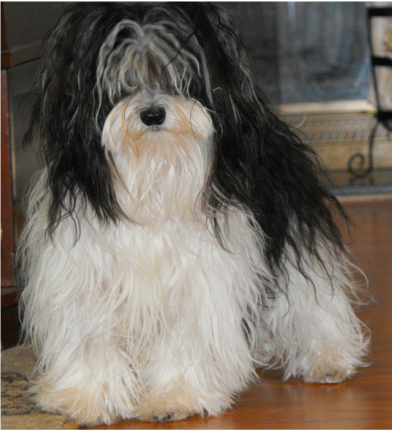 Havanese are a sturdy toy breed dog. They are great with children and are capable of rough play once they get older. They are extremely intelligent and learn quickly. It is alot of fun to watch the amazing & numerous tricks they are capable of doing. Grace will stand straight up, play dead, wipe her face, rollover....she is very graceful. Each one of her puppies were completely paper-trained by 5 weeks old. 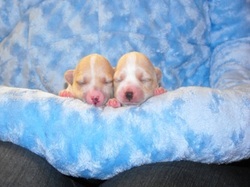 If they hadn't been born in winter, I have no doubt they would have been going outside to potty. These are very intelligent dogs. They are velcro-dogs and love to be with their humans. These are not dogs that will thrive being left alone for hours on end or crated for long periods of time....and will become depressed if left in such a state. In order to own one of my pups, your family must have someone who is a stay at home person, retired or working out of the home. The only other alternative if you work, is you must place your pup in doggy daycare during your working hours. One Reason why this breed may NOT be for you! The Havanese is a terrific dog. I am a lover of large dogs, but these little dogs have stolen my heart. They are tough and sturdy. They have a stubborn independent streak. If you are in market for a smart, easy to train dog that is not yappy...however, will alert you when they hear a noise-this may be the dog for you. However, if you are hard working & not at home several hours out of every day....this fact alone erases this breed as being compatible for you. If you will leave your puppy for more than 5-8 hours a day every single day, this dog will be very unhappy and not thrive in your home. Even living amongst other animals, this is a dog who has a strong need for human companionship. This is why they call them velcro dogs.....If you are not home most of the day.....Do yourself a favor and do this breed a favor...please, choose another breed! !